Media, fans, teams, drivers–just about everyone in the IndyCar community was wondering how long it would take Josef Newgarden to score his first win with Team Penske. We didn’t have to wait long for the answer, as the 26-year-old American inherited the lead from teammate Will Power when a left-rear tire puncture forced the former series champion into the pits during the race’s final stint. After holding off a charge from four-time series champion Scott Dixon, a tall order on any given weekend, The Honda Indy Grand Prix of Alabama belonged to the new Penske prodigy. Was it as bad as the four DNFs the team suffered at Long Beach? Not as far as final results go, but at least Alexander Rossi and Ryan Hunter-Reay showed winning pace that weekend. While Hunter-Ready did make the Firestone Fast Six in qualifying this weekend, early contact with James Hinchcliffe forced an unscheduled pit stop and it was all the No. 28 team could do to salvage an 11th-place finish. Takuma Sato was never a factor, qualifying 14th and finishing ninth. Marco Andretti started the race on pit road with mechanical gremlins and finished last. Alexander Rossi was the lone bright spot, combining decent pace and great strategy secure a fifth-place finish. Ed Carpenter Racing fielded two drivers that had never competed in an IndyCar at Barber Motorsports Park: team regular Spencer Pigot and one-off sub Zach Veach. Veach kept his nose clean all day and brought the car home in one piece, which is all you can really ask of a guy making his series debut. Pigot had an impressive run going, charging from 17th on the grid up to eighth before a late-race spin dropped him to the back of the field. Larry Foyt’s new duo of Conor Daly and Carlos Munoz experienced no major on-track issues or significant mechanical problems. That’s a win for a team still trying to find footing with its new Chevrolet aero and engine package. Munoz struggled with pace, but Daly was racy mid-pack before fading late. DCR had a better start to the season than anyone could have hoped, with Sebastien Bourdais winning at St. Pete and finishing second at Long Beach. Rookie Ed Jones entered the weekend at Barber Motorsports Park in the top-ten in points. Bourdais had the kind of weekend where you take an eighth-place finish and walk away content. Jones struggled with race pace for the first time this year, finishing the day in P16. Will DCR’s success in 2017 be limited to the temporary street courses, or did they just miss on Barber? Time will tell. Sometimes racing is a game of chance. Just ask Will Power after Lady Luck denied him the win on Sunday. That being said, Scott Dixon overcame an untimely caution at St. Pete that dropped him from second to mid-pack before he drove his way to a third-place finish. He led at Long Beach until an unfortunate strategy call forced him to claw his way back to a fourth-place finish. On Sunday, he was one bad corner (in which he opened the door for Newgarden to slip by) from snatching his first Barber win. IndyCar title contenders be warned: Dixon, although winless in 2017, is in championship form, and we’re only three races deep. 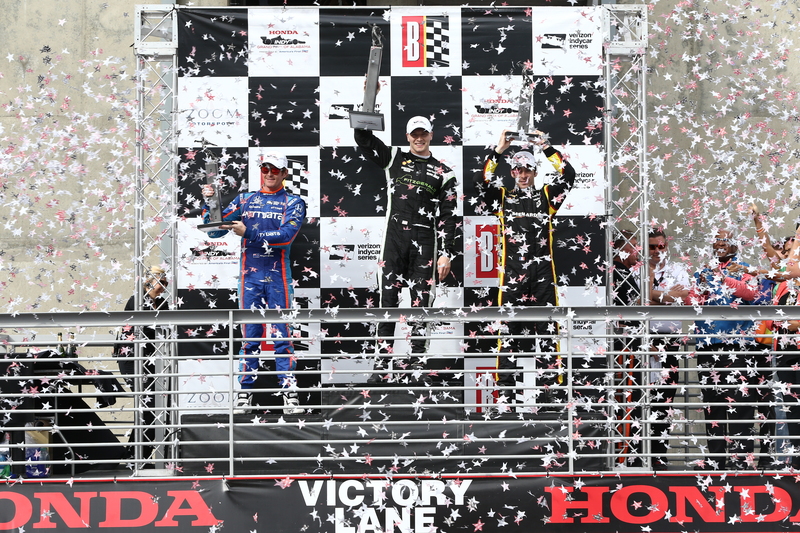 Aside from Fernando Alonso visiting Barber and rewriting the book on winning friends and influencing people, Josef Newgarden’s first win carrying the Penske flag is the story of the weekend. He’s the full package on and off the track, and that has a lot of people ready to crown him the future King of American Open Wheel Racing. It may not be surprising that he scored his first Penske win so early in the season, but even die-hard Newgarden fans would have to admit it is a little surprising he was the first in Penske’s very loaded stable to find victory lane in 2017. Yes, luck played a factor, but Newgarden was there to capitalize on it. All of that being said, Newgarden hasn’t won Indy and hasn’t yet claimed a series championship. Maybe those things will happen this year, but we would all be wise to take it one race at a time–you can bet that’s how he and Tim Cindric are playing it. What is worth getting excited about is that the potential is there, and we may get to see something truly special if he delivers fully on it. For now, we’ll just have to enjoy the ride.